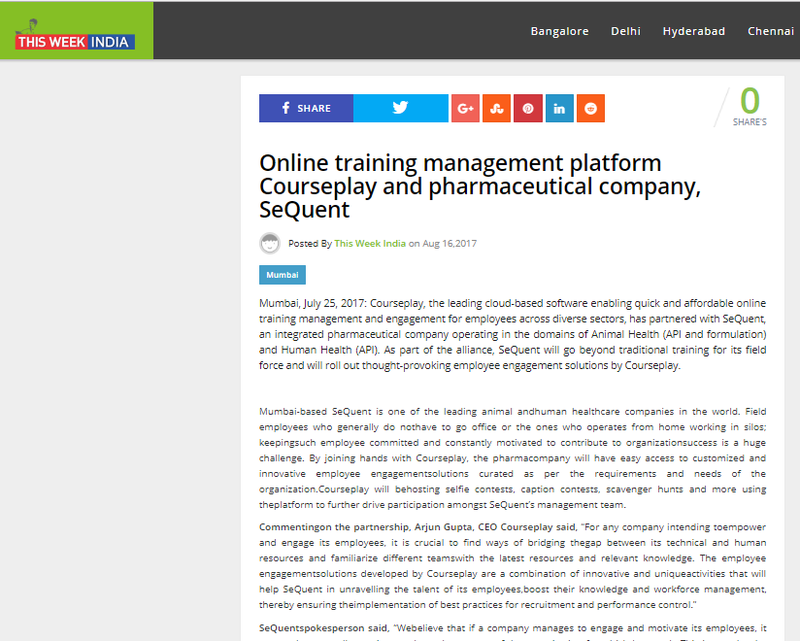 Mumbai, July 25, 2017: Courseplay, the leading cloud-based software enabling quick and affordable online training management and engagement for employees across diverse sectors, has partnered with SeQuent, an integrated pharmaceutical company operating in the domains of Animal Health (API and formulation) and Human Health (API). As part of the alliance, SeQuent will go beyond traditional training for its field force and will roll out thought-provoking employee engagement solutions by Courseplay. 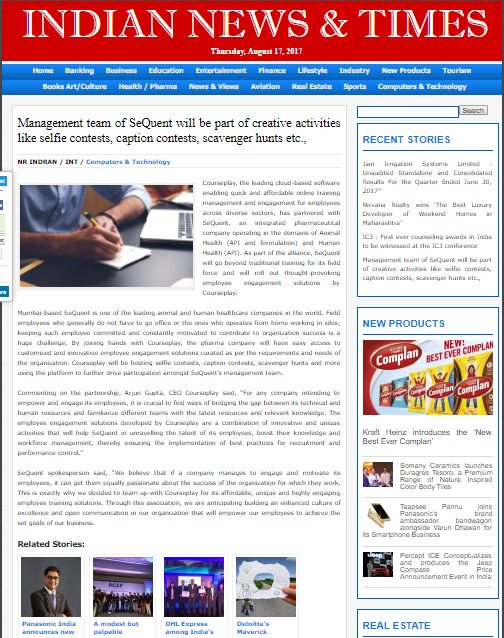 Mumbai-based SeQuent is one of the leading animal and human healthcare companies in the world. Field employees who generally do not have to go office or the ones who operates from home working in silos; keeping such employee committed and constantly motivated to contribute to organization success is a huge challenge. By joining hands with Courseplay, the pharma company will have easy access to customized and innovative employee engagement solutions curated as per the requirements and needs of the organization. Courseplay will be hosting selfie contests, caption contests, scavenger hunts and more using the platform to further drive participation among SeQuent’s management team. In India, nearly 54% of the workforce is dissatisfied with their jobs. A study conducted by the Indian Council for Research on International Economic Relations indicates that although India’s rapid economic expansion has enhanced corporate profits and employee incomes, it has also generated a surge in workplace stress that is hampering the employee engagement and productivity levels. This makes it crucial for the organizations today to incorporate creative initiatives in their work culture to boost engagement. 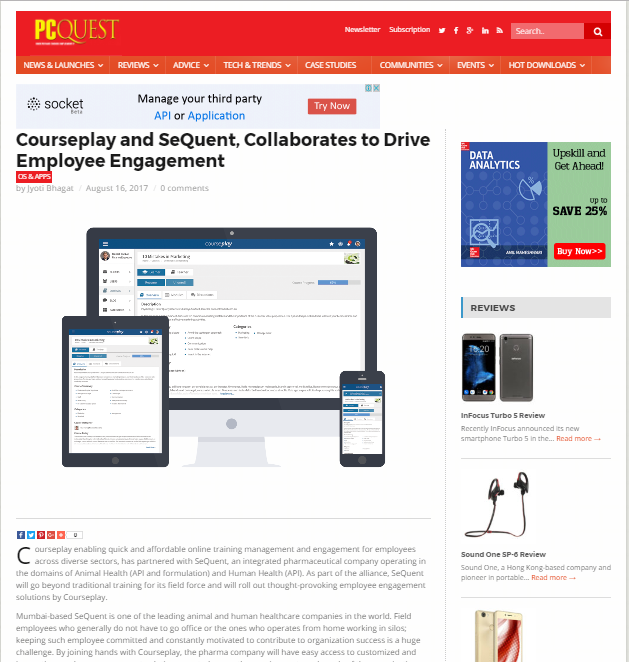 The strategic alliance between Courseplay and SeQuent stands as an apt example in this situation that will not only promote employee wellness but also help the organization in implementing a positive work culture with increased employee motivation. This article was covered by PC Quest, This Week India and Indian News & Times on August 16, 2017.